Esoteric end of the spectrum. You can practice both: It can appear that Mysticism or Yoga (union, from the root yuj, to join) are alternatives to religion, as if one must choose one or the other. This can lead to the unfortunate view that if seekers practice Mysticism and Yoga along with their religion, they are merely doing some sort of cut-and-paste process where two different paths are being combined. ...but that you cannot have both. in the Esoteric form of the religion. The principles of Mysticism and Yoga are already contained within the various religions. It is only because of incorrectly seeing them as necessarily having to exist separately from one another, that there appears to be solely a joining together. In other words, it can appear that one is doing a mere cut-and-paste job of affixing Yoga onto one's religion, while the roots of the principles are already there, in the religion, in the Esoteric form of the religion. Many of the people who practice Mysticism and Yoga do so from outside organized religion. However, they can also be practiced from inside religion as well, as they are already there, contained within the religions. For example, there are the Gnostics and the Sufis, known for their inner, mystical focus, while being related to their respective religions. Surely many people draw specific methods and techniques from the independent Mystics and Yogis, but the essence or spirit of the practices, as well as the goals of these practices are already part of the religions in one or another of their Esoteric forms. Two Polarities of Esoteric and Exoteric: Within each of the religions there are polarities of Exoteric and Esoteric, along with shades of gray between those two. The Exoteric is based on belief, while the Esoteric is based on attaining direct experience. Exoteric religion is the external form of religious practice, and is what most of us are accustomed to seeing in the majority of churches, temples, or other religious organizations or movements. Exoteric religion may sometimes be called either Traditional or Orthodox. Esoteric religion, on the other hand, has more to do with the inner experience, the subtler practices, and the pursuits of direct experience of the spiritual principles. It is the path of saints and sages, who have often been considered as deviants or outcasts by their own Traditional, Orthodox, or Exoteric religions. Esoteric is shunned: The Esoteric practitioners are often shunned by the Exoteric religionists because the subtler pursuits and practices are simply not understood. As one progresses along the Esoteric path, it is ever more clearly seen how the Esoteric and Exoteric are different degrees of expression and experience within the teachings of the same tradition or religion. Exoteric misunderstand the Esoteric: However, unaware of these subtleties, the Exoteric people are forced to see the Esoteric people as either having strayed away from the religion or suffering from some psychopathological malady. In time, they too may grow to see the breadth and depth of their own religion, but in the meantime, the journey of the Mystic and Yogi is neither understood nor accepted. Immanent or Transcendent God: There are two views of the nature of God, although different religionists or scholars might have vastly different opinions within each of those two. God as Transcendent means God as a separate being that is overseer of the activities of the world. God as Immanent refers to God as being all-pervasive, permeating the whole of manifest reality. The Mystic or Yogi seeking inner experience often, though not always, has a greater leaning towards God as Immanent, while the Exoteric religionist often tends exclusively towards God as Transcendent. With some reflection, it is easy to see how the Mystic or Yogi may easily be able to hold both perspectives in his or her spiritual pursuits. Often, however, the Exoteric practitioner is only able to see the notion of God as Transcendent, as a separate being, and therefore completely rejects the notion of God as Immanent. This is one of the reasons that the Mystic or Yogi may feel quite out of place in a religious culture dominated by those of the Transcendent God view. Material or Efficient Cause: There are two aspects to the cause of any created object. One is the Material Cause, which refers to the stuff out of which the objects are made. The other is the Efficient Cause, which refers to the question of who caused the creation of the objects. For example, flour is the Material Cause of bread, while the baker is the Efficient Cause. Similarly, clay is the Material Cause of a pot, while the potter is the Efficient Cause. The emphasis of the Exoteric religionist is usually almost exclusively on the Efficient Cause, whereby the separate being, the Transcendent God, is considered to be the creator of the universe and humans, much like the baker and the potter are the creators of bread and pots. The goals of spiritual life are seen to come as a result of the Efficient Cause. While the individual Mystic or Yogi may or may not emphasize the Efficient Cause called God, following one's own predisposition or religion, there is almost always a focus on the Material Cause, which is an inner journey, through the levels of one's own being, so as to find the core or center, which is underneath all the layers of manifestation. Depending on the perspective of the individual practitioner, this realization may be variously called Self-realization, enlightenment, knowing God, or other terms. Polarities are well known amongst academicians: It is important to note that these polarities of Esoteric-Exoteric, Immanent-Transcendent, and Material-Efficient are well known to the academic field of religious studies, as they are aspects of each of the more known religions. However, they are seldom mentioned, much less emphasized by the religionists claiming to lead the public or lay people. Most of the religious leaders promote the Exoteric, Transcendent, and Efficient polarities through their churches or temples, utilizing a vast array of icons and physical paraphernalia, along with external rituals or ceremonies. The teachers of the Esoteric, Immanent, and Material polarities are naturally less drawn to building churches or temples for external worship rituals, with any physical forms serving as pointers on the journey to the direct experience of the subtler, finer realities. Thus, they are far less visible in our societies and cultures. Although more hidden, the diligent seeker can find these more subtly focused teachings within virtually all of the religions. If you think of yourself as having a Mystic or Yogic orientation, the awareness of these polarities can go a long way to your understanding why you might find yourself to be in a minority, and possibly criticized by others. Conflict is within the religion, not with Yoga: Thus, what appears to be a difference between two separate paths, such as between a particular religion and either Mysticism or Yoga, is actually a conflict within that religion. It is often a conflict wherein the Traditional, Orthodox, or Exoteric followers are criticizing the Mystics, Yogis, and Esoteric practitioners within their own religion, and claiming that the conflict is with some outside source, Yoga. Criticism is of the Esoteric: In this way, many of the complaints of the modern religionists about the Mystical and Yoga movements are not really about some separate, new movements that are emerging in our cultures. Rather, they are criticism about the Esoteric aspect of their own religion. It is the resistance to their own subtler practices that is the source of the apparent conflict. Yoga simply bears the brunt of some of this confusion. 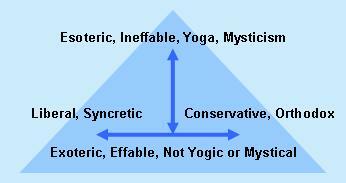 Labeling the Mystics and Yogis as Neo: It is common for some who have lost touch with the deeper aspects of their traditions to label the Yogis or Mystics in such a way that they appear as deviants. It is common for these people to put words like Neo, New or Modern in front of the religion or other yogic term to try to make the deeper practices sound like newly created distortions, rather than the ancient practices that they often are. The Exoteric people may also use the term New Age in a derogatory tone to describe the Esoteric practitioner. So too, some of the recently awakening Mystics and Yogis will adopt these types of terms, thinking that they are inventing something new. It is ironic that those who are most interested in the authentic Esoteric roots of various teachings are labeled as Neo or New by the Exoteric practitioners who are not interested in the higher, subtler practices of their own traditions. Remember the Mystics and Yogis of the past: It is useful for the sincere seeker to also keep in mind world history, wherein the Mystics and Yogis have often chosen, or been forced, to move deep into the mountains, forests or deserts to do their practices, so as to avoid the onslaught from others who are focused exclusively on the Exoteric perspective. This is not to say that the modern Mystic and Yogi should retreat from the world, but it can be comforting to recall that others, who have come before, and who have also tread the inner path, have experienced the challenges presented by the Exoteric people. Exoteric sees only one; Esoteric sees both: It is important to note that the further one travels up the Esoteric ladder, the more the seeker sees how both the Exoteric and Esoteric processes of religion coexist as part of the whole. However, the Exoteric follower often does not share this view, and sees only the Exoteric, as the upper reaches (the Esoteric) have not yet been seen or experienced. Being aware of the polarities in one's own religion: The modern seekers who are drawn to Mysticism and Yoga can benefit tremendously by being aware of, and occasionally reminding themselves of the Exoteric and Esoteric polarities within their own religion. Then they can have much greater freedom in deciding whether or not, and how, to practice Mysticism and Yoga in the context of their own religion.